When it comes to online games there are many different ways to measure success. Games can be praised for their good looks, engaging story and how long they have been around. But one metric matters above all others: the number of people playing. And while there are many online games, there are not many with a player base that numbers in the millions. Some that do, such as World of Warcraft, get talked about all the time. But there are others that have managed to amass millions of dedicated fans without that attendant hoopla. One such is Runescape - an online fantasy role-playing game created by British firm Jagex that has been running since 2001. It has a total player base of about nine million people. In the last two weeks, six million of those played the game. Year on year growth of that player base stands at about 35%. "It's been a well kept secret," said Geoff Iddison, Jagex chief executive. "All the growth has been viral, word-of-mouth." And it is not just its low-key approach to marketing that sets Jagex apart. 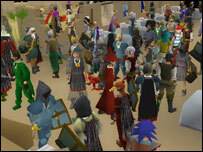 Unlike almost every other online game, Runescape does not require people to download gigabytes of data or ask them to travel to a store, buy a box, go home and install gigabytes of data. The Jagex company name is derived from "Java Gaming Experts" and the whole game is built with this programming language. The first Java programmers at Jagex were brothers Andrew and Paul Gower who put together the original code for what would become Runescape while studying computer science at Cambridge. Now Jagex employs more than 400 people - the average age of which is 22. The reliance on Java means Runescape runs in a web browser and the whole download to get playing is 1.3 megabytes in size. "You do not need a high-spec PC to play it," said Mr Iddison, "30% of our members play on machines that are more than seven years old." "You can download it to any PC anywhere you do not need to be at home to play," said Mr Iddison, "that certainly helps its stickiness." Players do not even need to pay to play. About 100 hours of adventuring time in the Runescape world of Gielinor can be had for free. Those wanting more can subscribe for £3.20 (4.55 euros) per month. 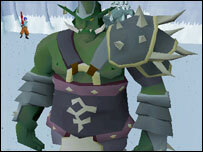 Runescape has about five times as free players as it does subscribers, said Mr Iddison. As with many other fantasy-based games, adventuring in Gielinor revolves around questing, killing monsters to improve your character's abilities, amassing loot and swapping it for cash to buy better gear for your avatar. 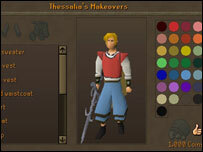 Runescape also has a comprehensive crafting system so characters can learn to make and enchant all kinds of items. This, combined with the popularity of Runescape, means that Jagex, like many others, is battling the black market in items and money that can be used in Gielinor. The current exchange rate is one million Runescape gold for about £2.50. Mr Iddison said this trade is explicitly against the terms and conditions of the game. Anyone caught trading will be banned. "We feel it spoils the game for other players," said Mr Iddison. Many people, he said, have literally spent hours adventuring so they gain the skills and cash to kit out their character and display that prowess. Having someone just buy their way to the top seems like cheating, he said, and many Runescape fans resent those that pay rather than play. "The average paying player is on Runescape for 22 hours per week," said Mr Iddison, "and free players are not far behind." Jagex also polices the many kingdoms of Gielinor to stop people "farming" gold themselves or with "bots" - computer controlled characters. To catch out the bots the game hits players with random encounters. While people can deal with these they flummox a bot running on automatic that can only do a few things well. But, said Mr Iddison, Jagex has not set its face totally against games that are part-funded through item sales. Future titles, he said, may be based around that idea. "But," he said, "we've no plans to do item sales in Runescape. The game is so deep that it would mean a big re-write." Mr Iddison was brought in from PayPal to expand the Jagex business and in 2008 it plans to launch a couple of new titles. All will be online games but, so far, the company is not saying any more about them other than that they will use the same Java and browser technology seen in Runescape. Dedicated fans need not worry though as, said Mr Iddison, Runescape will be the main investment focus for Jagex for the next five years. It is not only gamers who will be keeping an eye on Jagex. Games that are free to download, browser based and fund themselves through item sales or low-cost subscriptions are becoming more popular. Some pundits believe this type of game will eventually replace the likes of World of Warcraft and its ilk. There is good reason to believe Mr Iddison when he said: "These are interesting times for Jagex."